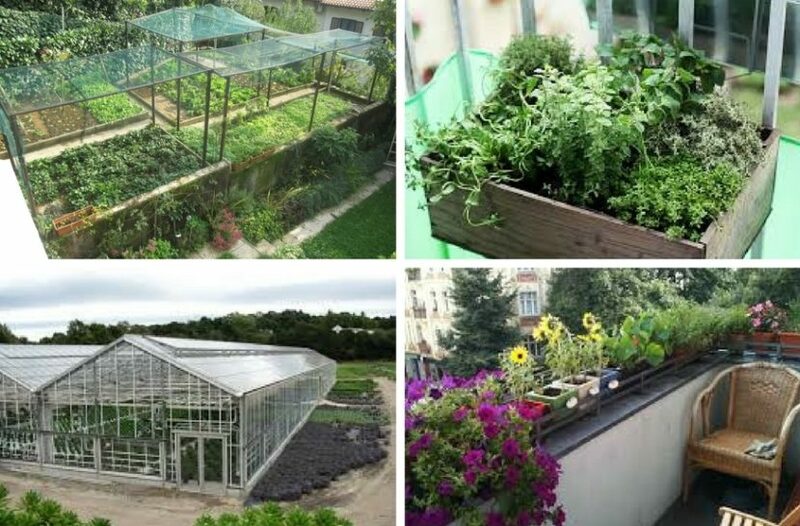 It is possible to grow your vegetables in the balcony as well. Herbs can work especially well. South-east or south-west balconies get the optimum sunlight for a garden. In warmer areas the balcony crops have to be protected from hot summer sun if they are on the south (or south-east and south-west) side. North balconies are less appropriate for a garden, bit you can still grow lettuce there. Depending on the crops you will choose to grow in you balcony, pick pots with enough depth: at least 20 cm (7 in) for lettuce, legumes and leafy vegetables; 40 cm (1.3) ft for root vegetables, onion, peppers, eggplant and cucumbers; and even additional 10 cm (3 in) deeper for tomatoes. You can use plastic bottles, larger shopping bags, old cooking pots and similar for containers. Plastics, glass and metal keep soil moisture well. Put a layer of drainage pebbles on the bottom of the pot (2 cm / 0.8 in) and cover with fertile soil (a good mixture is 20 % of garden soil and 80 % of quality plant substrate). You will only need a small spade and a water can for cultivation. Water more frequently and in smaller amounts when the temperatures rise, and vice versa. In any case, you should use enough water that it reaches the roots. Protect the soil with mulch. It is recommended to use fertilizers, but very moderately. The best are slow-release fertilizers. If you don’t replace the pot soil, it is recommended to use crop rotation as well. Locate your greenhouse at the sunny part of the garden, away from trees, with easy access to your house, water and electricity. You can heat it or let the sun warm it up, but always enable sufficient air circulation. Regarding materials to build the greenhouse (the frame and the cover), consider price, durability and aesthetics. An aluminum frame is more durable, while a wooden one looks better. A glass cover can be dangerous, however it is the most appropriate. You can choose electric heaters (with thermostat) or gas heaters (they are more demanding for maintenance and usually don’t have a thermostat). In essence, organic gardening includes intercropping (companion gardening), mulching (for a moist, soft and alive soil), natural fertilization (for adding nutrients), natural protection against pests and composting. Permaculture is a branch of eco design, engineering and environmental design, developing sustainable frames and self-sufficient agriculture systems on a basis of natural ecosystems. A permaculture garden is a self-sufficient sustainable garden that is cultivated in harmony with nature. It avoids chemical substrates and artificial fertilizers. In such a garden, vegetables and other plants are being observed and if needed, changes are made. Sow or plant the crops that can grow in your location. As much as possible should be recycled, all from organic waste (composting) to excess boards that can be used for raised beds. Biodynamics is a very specialized method of agriculture. In addition to ecology, it abides by the laws of natural movement of the Earth and the seasons. It was established by Dr. Rudolf Steiner and continued by Maria Thun. By very detailed observations and monitoring Thun made several discoveries and proved them scientifically. The basics of biodynamics are organically and biodynamically grown seeds and seedlings, composting, crop rotation, special substrates for crop protection (similar to homeopathic) and minerals for crop strengthening and protection against disease and pests. Biodynamic gardeners don’t use GMOs, seed disinfection, artificial fertilizers, pesticides or other chemical agents. They can be only a few centimeters (inches) raised from the ground. Higher ones are appropriate for gardeners with physical disabilities: 60-75 cm (2-2.5 ft) for people in a wheelchair, 75-90 cm (2.5 to 3 ft) for working standing up. You can make them out of wood, paving slabs, bricks or granite cubes. Wood has to be properly protected, but don’t use railway bars as they are protected with creosol. Leave a hole in the sides for water drainage. Raised beds should be 60 cm (2 ft) wide for one-side access and 120 cm (4 ft) for both-sides access. Raised beds can be used on low quality or polluted ground. Spread gravel at the bottom for water drainage and fill with soil and compost. As you will not be walking on these beds, you can use the no-digging method. If your garden is on a steep terrain, the only solution is to make a terrace garden to prevent erosion. Carve the terrace into a slope on one side and build it on the other side to make one or more level/horizontal beds. Low wall fence prevent soil erosion. Vegetables can be very beautiful. If you want to test yourself in ornamental vegetable gardening, sketch a simple plan in ordered geometric patterns and chose crops that don’t lose their ornamental value when picked. Use late-harvest sorts of carrots, cauliflower, leek, cabbage and onion to avoid empty spaces. Remove weed frequently and carefully control potential diseases and pests. Some crops that are good for ornamental gardens: artichokes, bush tomatoes, asparagus, peas, multicolored herbs, squash and pumpkins, pole beans, salad onion, various colorful sorts of lettuce and pepper.